Marriott International Group announced the opening of Shanghai Jing'an Fairfield by Marriott on December 29. The opening marks Marriott International's rapid growth and constant expansion in China. The new hotel is located in Shanghai's Jing'an district, adjacent to a prosperous business and trade area. Shanghai Jing'an Fairfield by Marriott was built by the Shanghai New Development Group which also manages its operations. "The opening of Shanghai Jing'an Fairfield by Marriott is another significant milestone in Fairfield by Marriott's brand development," said Mike Fulkerson, Marriott International Group's vice president of brand promotion in the Asia-Pacific region. "Following the brand's entering the Chinese market this year, by an active extension of strategic arrangement and business, we have acquired a huge result." He said in addition to expanding into the fast-developing second- and third-tier cities, the brand "will provide a warm and comfortable experience for travelers all over the world in more international metropolises." Fairfield by Marriott is one of the fastest growing brands in the global hotel industry with more than 900 hotels in the world. 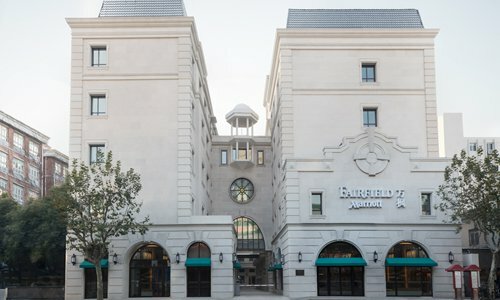 Since its establishment 30 years ago, Fairfield by Marriott has consistently provided a comfortable and carefree experience for its guests along with dedicated and trustworthy service for each business and leisure traveler at a reasonable price. Shanghai Jing'an Fairfield by Marriott boasts a superior location that is convenient for commute all around the city. The hotel is 20 kilometers from Shanghai Hongqiao International Airport and 50 kilometers from Shanghai Pudong International Airport, which makes traveling to and from these international transportation hubs very convenient. Downtown Shanghai is just a 15-minute drive from the hotel. The proximity also means that guests can visit any of Shanghai's many popular areas on foot, including Shanghai Circus City, Shanghai Daning Internal Business Center, Daning Lingshi Park and Shibei High-Tech Park. "We are honored to be the first Fairfield by Marriott hotel in Shanghai. Our hotel not only enjoys a convenient commute but also preserves the traditional style of Shanghai's architecture which allows guests to experience old Shanghai at any time in this most dynamic destination in China," said Huang Lianfeng, the general manager of Shanghai Jing'an Fairfield by Marriott. He added that Shanghai Jing'an Fairfield by Marriott "will firmly perform the brand promise to provide a warm, pleasant, dynamic and comfortable check-in experience for each guest." The lobby design of Shanghai Jing'an Fairfield by Marriott is both modern and bright as it maximizes the use of natural light. There are 195 simple yet very fashionable rooms in the hotel, each of which has been equipped with a high-definition television and a high-speed Wi-Fi network connection. Each room is designed to satisfy the various demands of contemporary guests from comfortable furniture and facilities to a well-designed work area with adjustable lighting, ergonomic chairs and multifunctional electric plugs. Shanghai Jing'an Fairfield by Marriott also provides a variety of complimentary breakfasts, including oatmeal fried eggs, sausages, homemade waffles, fruit, yogurt, cereal and other healthy foods. Guests may also purchase snacks and beverages in the hotel's 24-hour supermarket. The hotel also has a 24-hour fitness center equipped with advanced equipment that can help guests keep up their fitness regimen while away from home.